Oh my goodness, do I have something extra special to share with you today! Grab yourself a cup of tea, get comfy and prepare yourselves for a feast for the eyes! A few months ago, the lovely Christine from Dabble Me This wedding photography approached me about collaborating on a French styled wedding shoot which would be held in Chicago in November 2013. The sheer beauty of the brief blew me away – I’d describe it as Parisian chic meets timeless whimsy, all contained in a bottle of bubbly champagne! The venue – RM Champagne Salon in Chicago – was where this shoot came alive. Think warm gold tones, buttery soft mint, crystal glasses, exquisite French inspired decor and a charming handsome couple. The perfect setting for an intimate French inspired wedding! 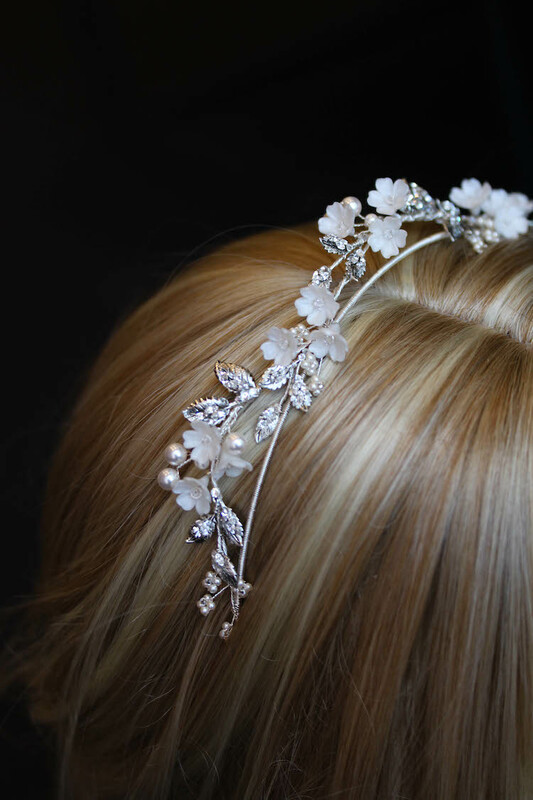 For the shoot, I created the Giselle bohemian headpiece featuring gold jewellery wire, teeny tiny Mother of Pearl flowers and countless freshwater pearls, crystals and silver seed beads. A charming piece, perfect to create a whimsical bohemian look with timeless appeal. I love the soft organic nature of the headpiece and the way it weaves along the bride’s soft perfect curls. It was truly a pleasure to have the opportunity to work with Dabble Me This and this talented team of photographers and wedding vendors. The stunning images speak for themselves and you must head over to Dabble Me This, Jacqui Cole Photography, Keren Sarai Photography, Photography by Aparna Paul Jain, Kelly McCue Photography, Nikole Marie Photography websites to view more of their work. Oh, and be sure to scroll right through to the bottom of this post for the full list of vendors!